By means of different attachments, duty cycle crawler cranes can be used for various purposes, for example in material handling, where they are provided with grippers or dragline buckets, for demotion work, in dynamic soil compaction, or also with diaphragm wall grabs. 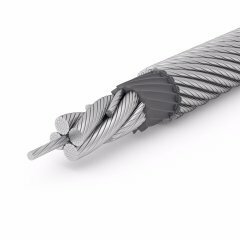 When used with casing machines, universally applicable high performance steel wire ropes are needed. TEUFELBERGER high performance steel wire ropes meet the requirements such as high rotation resistance, extreme resistance to wear and high resistance to external influences occurring during operation such as shock loads. In the field of hoist ropes for duty cycle crawler cranes, TEUFELBERGER offers highly compacted rotation resistant high performance steel wire ropes featuring extremely high load capacity, robustness and flexibility, which are successfully used on piling equipment. When used with diaphragm wall grabs with mechanical grab drive, a compacted 8-strand hoist & closing rope is chosen frequently. TEUFELBERGER steel wire ropes are made complete only with tested rope end terminations such as button sockets for commercially available pouch sockets or solid thimbles. All ropes leaving the premises of TEUFELBERGER have been subjected to quality testing and are provided with acceptance certificates. This high performance steel wire rope with its advanced design excels due to high flexibility and extreme durability.